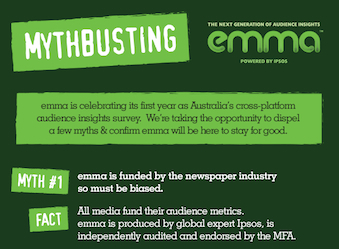 In Australian media news this week, Nine and Fairfax are reportedly planning a video streaming service together, the launch of Catablog, a new bloggers directory, the commercial radio awards finalists are announced, The Economist posts a bizarre reader letter and EMMA turns one. Nine Entertainment Co and Fairfax Media are set to join forces in video streaming with a $100 million partnership. The Sydney Morning Herald has reported that the yet-to-be-finalised deal would involve each company investing $50 million into Nine’s planned video-on-demand service, Stream Co. The companies are expected to announce the joint venture in the coming weeks after more than three months of negotiations, according to The Sydney Morning Herald. The Australian is reporting that Fairfax Media plans to buy a strategic stake in Nine Entertainment Co in order to gain a seat on the company’s board. The two companies could undergo a $4 billion merger if regulations change, The Australian has speculated. Currently, Fairfax is prevented by law from owning more than 15% of Nine. Catablog, a new bloggers database launched today, claims to be Australia and New Zealand’s most comprehensive online directory of blogs, bloggers, social connections, social scores, websites and contact information. The new subscription directory aims to allow brands, advertising agencies and PR companies to easily identify and connect with audiences through targeting online influencers. Catablog says brands can save time and money by identifying influential bloggers by area of interest, viewing their rankings and instantly connecting. A growing list of 2000 qualified blogs is currently in the system, listed by category and ranked based on social audience and reach. Catablog has been developed by technology expert and IT media commentator Trevor Long, journalist and radio producer Janyne Moore and Prue MacSween, social commentator and Director of PR company, Verve Communications. Long says the blogs will be ranked in real-time every day. Commercial Radio Australia (CRA) has announced finalists for its 26th annual Australian Commercial Radio Awards (ACRAs). Hot Breakfast (Eddie McGuire, Luke Darcy & Mick Molloy, Triple M, Melb, SCA). the Continuous Call Team (Ray Hadley, Bob Fulton, Steve Roach & Darryl Brohman, 2GB, Syd, Macquarie Radio Network). Other awards include ‘Best Newcomer On-Air’, ‘Best Current Affairs Presenter’, ‘Best News Presenter FM & AM’, ‘Best Music Special’, ‘Best Sports Presenter’, ‘Best Music Presenter’, ‘Best Marketing Campaign’ and ‘Best Digital Radio Format, Long Term’. Nominees from country, provincial and non-metro radio stations make up a total of 175 ACRAs finalists. 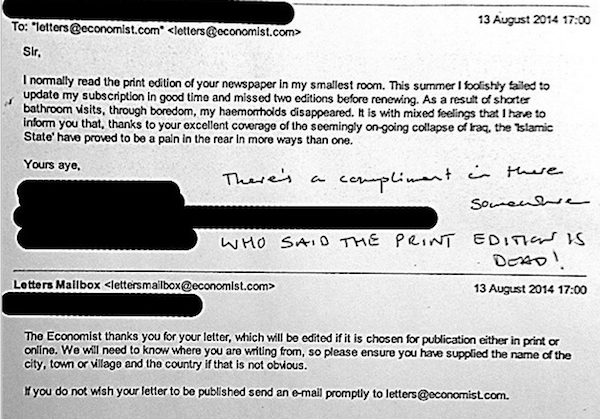 The Economist has published to its Instagram account an absurd letter from a reader who claims to have experienced health benefits from cancelling his subscription with the magazine. I normally read the print edition of your newspaper in my smallest room. This summer I foolishly failed to update my subscription in good time and missed two editions before renewing. As a result of shorter bathroom visits, through boredom, my haemorrhoids disappeared. It is with mixed feelings that I have to inform you that, thanks to your excellent coverage of the seemingly on-going collapse of Iraq, the ‘Islamic State’ have proved to be a pain in the rear end in more ways than one.